Scarring of the kidneys, or glomerulosclerosis, has many causes, including diabetes -- the most common cause in the United States -- high blood pressure, drugs, infection and autoimmune processes such as lupus. Kidney scarring can lead to multiple long-term effects, some of which -- such as protein and blood in the urine or high blood pressure -- have no symptoms, while others can result in noticeable symptoms like swelling of distant parts of the body or heart disease. Scarring is irreversible, but further damage can often be prevented or slowed with treatment. Proteins, the building blocks of the body, circulate in the blood. A major role of the kidneys is to clean the blood by filtering out wastes that the body produces and excreting them in the form of urine. Most proteins are too big to pass through the normal filtration system of the kidney during this process and remain in the bloodstream. With glomerulosclerosis, however, the filter -- the glomerulus-- is damaged, allowing proteins to leak into the urine. This excess protein in the urine is called proteinuria. Proteinuria itself causes no symptoms and can only be detected by testing the urine. But with significant proteinuria, swelling of the hands or feet may develop. Blood in the urine -- hematuria -- is another sign of kidney damage. With glomerulosclerosis, not only are proteins able to pass through the kidney's damaged filter and be excreted into the urine, but red blood cells are as well. According to the January 2012 issue of "Nephrology Dialysis Transplantation," experimental studies have shown that when blood leaks through the glomeruli, it can cause inflammation of the tubules, the next segment of the filtration system, leading to additional damage. In glomerulosclerosis, blood in the urine is not detectable by simply looking at the urine since it is only present in microscopic quantities. Identification requires laboratory testing. Increased blood pressure can be both a cause and a complication of glomerulosclerosis. The kidneys play an important role in maintaining normal blood pressure by releasing a hormone called renin into the blood. With glomerulosclerosis, scarring of the kidneys can adversely affect their ability to form this hormone and regulate blood pressure. High blood pressure may in turn contribute to worsening kidney function by damaging the small blood vessels of the kidney, leading to glomerulosclerosis. Elevated blood pressure can also cause other complications such as heart disease, stroke and problems with circulation to the limbs. Control of blood pressure using medications both helps prevent worsening kidney function and additional complications. 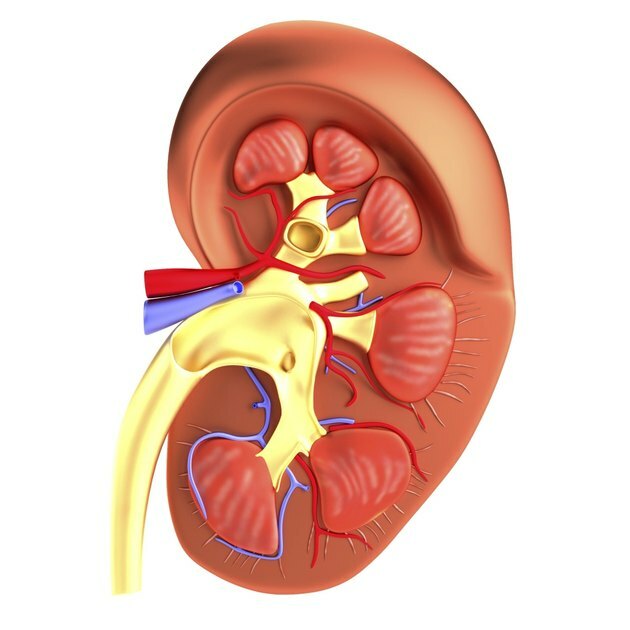 Because an important job of the kidneys is to control fluid balance, progressive glomerulosclerosis eventually can lead to excessive body fluid and swelling. The kidneys also control the quantities of electrolytes in the body, including calcium and potassium. Maintaining the relative ratio of electrolytes and other hormonal substances is important for a normal heartbeat to prevent arrhythmias; the production of red blood cells to prevent anemia and clotting cells to prevent abnormal bleeding; and normal bone health to prevent osteoporosis, fractures and muscle weakness. Imbalances in these substances occurring in the end stages of kidney disease may lead to a vast array of complications affecting many different organ systems. Nephrology Dialysis Transplantation: Haematuria: the Forgotten CKD Factor?